Click here to return to the B'nei Mitzvah page. Click here to go back to Sh'ma. Click here to go forward to Adonai S'fatal Tiftach. The prayer that we call "V'ahavta" is actually the continuation of the Sh'ma. Traditionally, the Sh'ma consists of three biblical passages from the Torah. The first passage (Deuteronomy 6:4-9) is the first paragraph above; it states the obligation to love God and to live with the words of the Sh'ma close to you in everything you do. The second passage (Deuteronomy 11:13-21) is not included in the prayerbook of the Reform Movement; it describes God's reward for obeying the commandments and the punishment for disobeying. The third passage (Numbers 15:37-41) begins with the commandment to wear tzitzit, the fringes on the corner of the tallit (not included in our prayerbook) and ends with "L'maan tizk'ru…," the section that states the obligation to remember and do all of God's commandments. ​Traditionally, the Sh'ma is recited twice each day, in the morning and evening worship services. This reflects the commandment within the passage to recite the words "when you lie down and when you rise up." 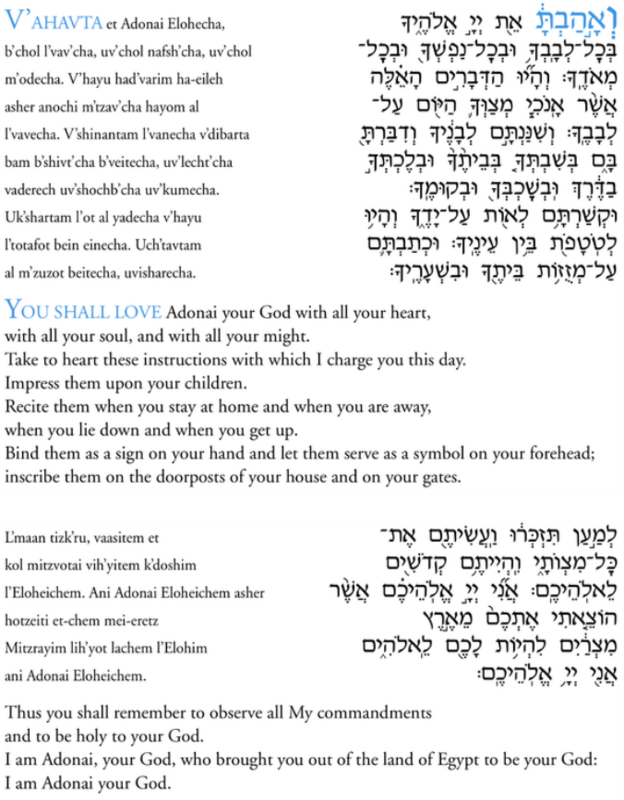 The passage also includes the commandment to put a mezuzah on the doors of our homes ("…inscribe them on the doorposts of your house…"). It might occur to you that the commandment to love God in this passage is difficult to understand and to fulfill. How is it possible to order someone to have an emotion? How can love be commanded? Here is one way to understand the commandment. We recognize that, when people love each other, they do things for each other that deepen the love between them. For example, when I prepare a meal for the person I love, or when I wash the dishes after the meal, I do so, in part, because I know that it will make my partner happy. That makes me feel happy, too, because I enjoy meeting the needs of the person I love. Doing things like that makes me love my partner even more. It is the same in our relationship with God. When we do what we know God wants from us – the mitzvot – it makes God feel good and it makes us feel good, too. Doing mitzvot deepens the love we share with God. You may experience this yourself when you do something to help a person in need. It feels good to do things that are good, in part, because it makes you feel closer to God. The commandment to "love God with all your heart, with all your soul, and with all your might" can be understood as a commandment to do the mitzvot with a feeling of joy and love. When you perform a mitzvah in this way, it deepens your love for God. The commandment to love God is not just an order to feel a particular emotion. Rather, it is a commandment about the attitude you have when you do things that draw you closer to God. Loving God and deepening your love for God is a choice you make every day through your actions. Want to sign up for the Temple Sinai weekly email? Click here to receive weekly updates on Temple services, events and a message from the Rabbi.